Rescuers were alerted to the perilous plight of two climbers found dead on Scotland’s most northerly Munro by the tragic mountaineers themselves. 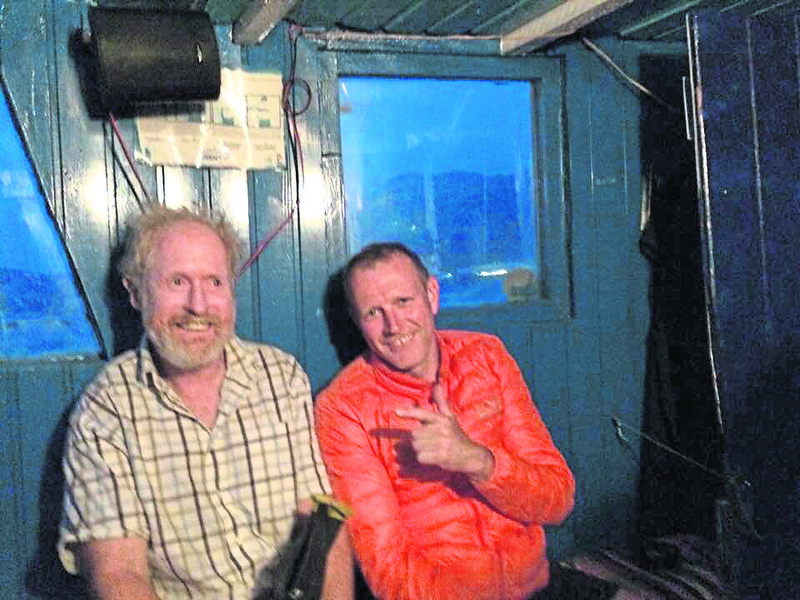 Prolific winter climbers Andy Nisbet, 65, and Steve Perry, 47, got into severe difficulty after falling on Ben Hope in Sutherland – with one of them then raising the alarm about their desperate situation and warning they could die if not found quickly. But they were in an extremely remote location on the 3,041ft peak and their bodies were only finally recovered around 20 hours later. Tributes yesterday poured in for the pair of well-known climbers, who had forged a strong partnership in establishing new routes on Scotland’s mountains, and in particular on Ben Hope. 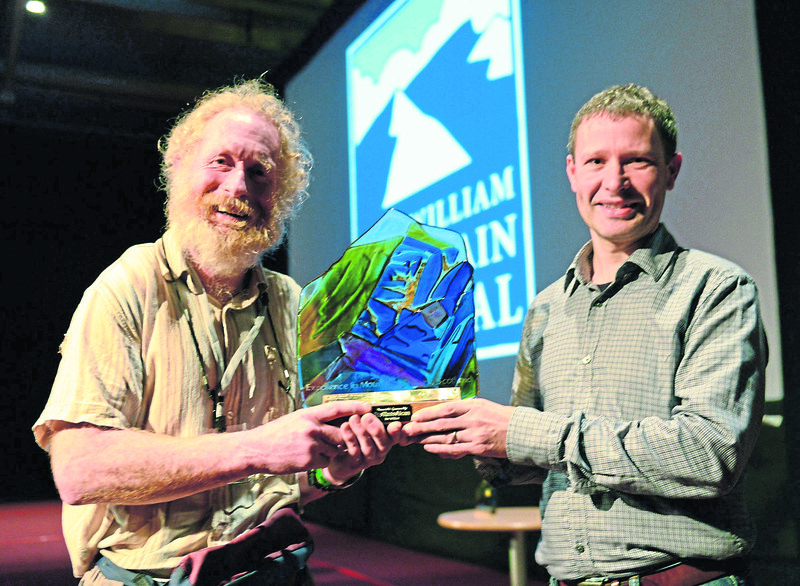 Award for Excellence in Mountain Culture is awarded to Scottish climber, instructor and all-round mountain enthusiast, Andy Nisbet (left) by Director of Rio Tinto Alcan Lochaber Smelter, David Jones. It is believed the men had finished their climbing route for the day but slipped on the upper slopes. The alarm was raised by one of them at 3.45pm on Tuesday. A Coastguard helicopter crew spotted the bodies at 2am on Wednesday, but the bodies were not finally recovered until later that afternoon. Aberdeen-born Mr Nisbet, who lived in Boat of Garten, north of Aviemore, was described as being a pioneer ‘synonymous with Scottish winter climbing’, with more than 1,000 new routes to his name. The former chemist, nicknamed “honey monster” because of his appearance, authored guidebooks and had a career in climbing instruction, including at Glenmore Lodge. Glenmore principal Shaun Roberts said “This is a true loss to the climbing community and they will be missed greatly. 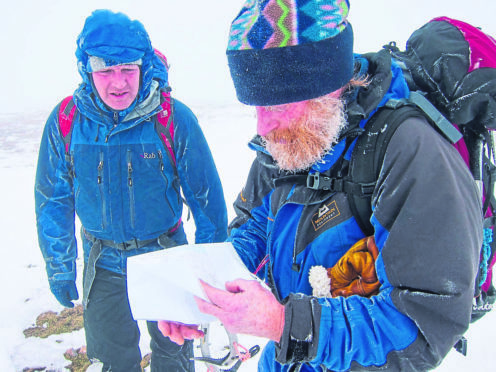 Former RAF Mountain Rescue Team leader David Whalley described Mr Nisbet as “the most active prolific mountaineer that Scotland has ever produced”. Steve Perry, originally from Lancaster but most recently living in a lodge at Dalcross Castle, between Culloden and Croy, was also a passionate mountaineer with new ascents to his credit. At the age of 19, Mr Nisbet was at the time the youngest person to complete the Munro’s. Mountaineering Scotland said it was “shocked and saddened”.